Unless you’ve been living under a rock for the past few years, you’ve probably noticed that indie game development has latched onto crowdfunding in a big way. It allows smaller, riskier projects to be realized to the degree that their creators envisioned without the financial support of a larger publisher. As you can see at the top of this site, we’re planning to go in that direction eventually. When we really get to that point though, we want to make sure that we are able to make it a satisfying experience all the way through, from the moment you donate to the moment the game is finished and ready to ship. A big part of that is the inclusion of crowdfunding rewards! 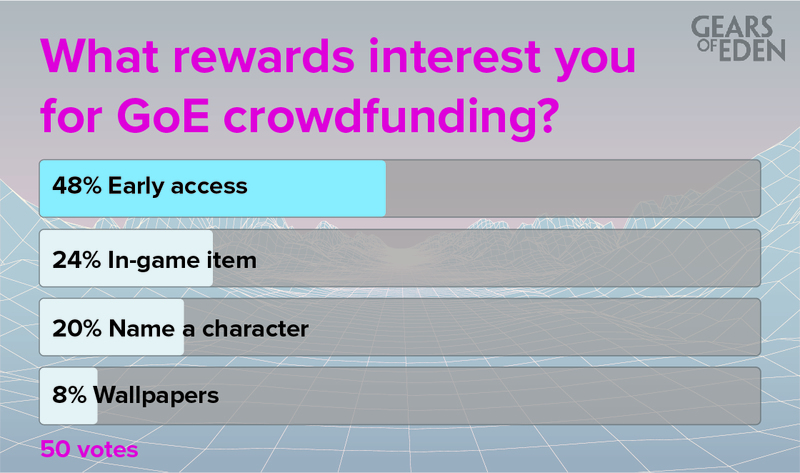 Because of this, we asked you last week via a Twitter poll what sort of rewards would help you get most excited for a crowdfunding campaign. Our poll included the following: Wallpapers, Early Access, In-Game Item, and the opportunity to name a character. As you can see above, after 50 votes, wallpapers don’t stand a chance against in-game items or named characters, and all three of these options are dwarfed by the incredible response to the inclusion of early access. You can rest assured, we hear you loud and clear with this! Our first form of early access, by the way, will be our free alpha testing waves. To be considered for alpha testing, please enroll here. What platform do you most enjoy gaming on? #gaming #gamedev #indiedev #GoE https://t.co/DcSn31awG3 Retweet pls! This week’s poll is about gaming platforms. Gears is being developed with the Unity engine, which means we have some flexibility in what platforms we target. Right now, we’re aiming toward the PC/MAC environment. But, we’d like to consider other platforms in the future. So, vote and let us know your gaming preference!